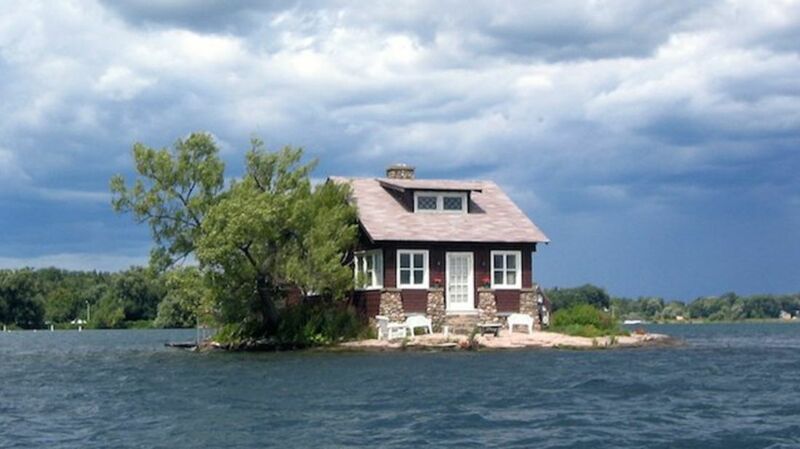 Here's one way to ensure you never have to deal with obnoxious neighbors: Build a summer home on an island big enough for your house and your house only. That's exactly what the Sizeland family did when they purchased this tiny speck of land, part of the Thousand Island chain, in the 1950s. But not any old rock can call itself an island. To enjoy that designation (and count itself among the 2000 islands that straddle the Canada-U.S. border in the Saint Lawrence River), a land mass must be larger than one square foot, remain above the water level year-round, and sustain at least one tree. In an effort to meet all of the requirements, the Sizelands planted a tree on one side, put a couple of lawn chairs out front, and built a quaint little home on every other inch of their accurately-named "Just Room Enough Island." But even after all that, the Sizelands' plan to get away from it all backfired. Their quirky cottage started to attract media attention and quickly became a popular tourist attraction. Sadly, the Sizelands' quest for a truly inaccessible island continues.